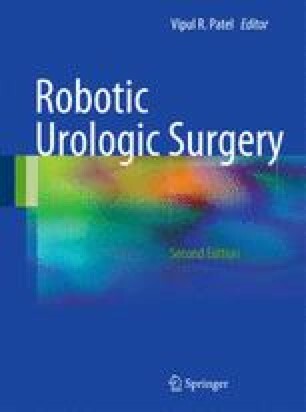 Robotic-assisted radical cystectomy (RARC) is an evolving procedure that combines the minimally invasive benefits of laparoscopy and the enhanced dexterity and vision of robotics. An International Robotic Cystectomy Consortium (IRCC) has been established to collate data from the few academic centers performing this challenging operation. Although the blood loss, hospital stay, and recovery are shorter than open surgery, operative times are longer. In nonrandomized comparisons, the complications appear to be lower than open and laparoscopic radical cystectomy. Actuarial and recurrence-free survivals at 3.5 years are 95% and 90%, respectively. A single port site recurrence has been reported. The authors acknowledge financial support from the Department of Health via the National Institute for Health Research (NIHR) comprehensive Biomedical Research Centre award to Guy’s & St. Thomas’ NHS Foundation Trust in partnership with King’s College London and King’s College Hospital NHS Foundation Trust. Guy’s and St. Thomas’ Charity, British Urological Foundation.